Travelador is a WordPress LayersWp child theme, created for all kind of blog, like: personal, travel, cooking, etc. 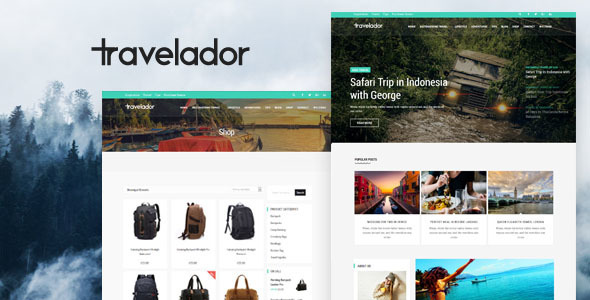 Based on LayersWp framework and Siteorigin builder, Travelador is by far a multi-purpose and responsive theme blog allowing you to set up your own web page without painfulness with its outstanding feature such as varied header with 5+ styles, drag & drop Page Builder, speed & SEO optimized, custom css, widgets customised, Woocommerce ready. We also inlcuded in pack Import file, slider for import, SiteOrigin pages, widgets as text (just copy paste in sidebar). 6. Go to WordPress Appearance – Customizer and add logo, choose header type, choose layout full width , Footer 1 widget and other config options and save. 8. Create your menu and, add your pages, set to primary and save. 10. For demo check folder Import.